A sheet of coloured gel (originally gelatine, and now heat-resistant plastic) is placed in a colour frame (or gel holder) in the colour runners at the front of a stage lighting instrument. Gels are produced by a number of companies, but two popular ones are Lee Filters (in the UK) and Rosco Laboratories (in the USA). 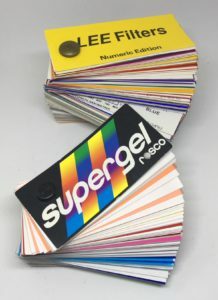 The Rosco Supergel range is widely used, as the gel numbering system is easy to use. It therefore follows that for a show that needed a number of different colour washes, you’d need a set of lanterns with the appropriate gels for each of the colour washes. For a large musical, the rig would very quickly be filled just by colour washes. In the very early days of stage lighting, coloured battens were used in rows above the stage. These consisted of a number of lamps with a reflector behind each, and a different gel in front of each. For a red wash, all of the red-gelled lamps were turned up. However, these weren’t very efficient, so higher-power individual lanterns with fresnel lenses were able to produce a more focussed pool of light. From those early days, there were ways of remotely changing the gels in front of each lantern. In large venues, profile lanterns (aka ellipsoidals) are used front of house, to throw / project the light a long distance to the stage. Due to limited space in the auditorium, colour changers known as Semaphores were used to electrically raise and lower gel holders in front of the beam. These had the advantage of being able to use multiple gels at the same time to achieve a wider range of colour mixing effects. Over the stage or in the wings, a more simple device called a Colour Wheel was used, consisting of a wheel with a number of holes to take different gels, which could be rotated in front of the lantern. Some manufacturers enabled you to remotely select the colour that you wanted the wheels to go to – a very simple way of achieving a range of colour washes with only one set of lanterns. In the 1980s, a different idea appeared, called a Colour Scroller. This enabled a long string of taped-together gels to be passed in front of the lantern under the control of the lighting desk. Some scrollers could handle up to 16 different gels, and sophisticated effects could be achieved, as long as the gels were moved slowly to avoid a rustling noise. When LED stage lighting became economically feasable in the 2010s, lighting fixtures with red, green and blue LED light sources were available that could produce an almost infinite variety of colour combinations instantly, more efficiently, and more reliably. As the technology matured, white and amber LEDs, and then more subtle variants like ETC’s lime green range, came along to improve the quality of the colours produced, to the extent that some venues have stopped using gel altogether and now have entire lighting rigs using only LED light. The primary colours of light are red, green and blue. The secondary colours of light are cyan, magenta and yellow. Using two lanterns with different colours, focussing onto the same area. Adding colours together to get closer to white. The three primary colours mix to form white as do certain pairs of colours known as complementaries. Complementary colours are red+cyan; yellow+blue; green+magenta. However, be aware that the gels used in stage lighting are not pure colours. Using two gels in the same lantern OR mixing secondary colours in a moving light. Subtracting colours to get closer to black. In the 1920s, Adrian Samoiloff created a considerable stir by exploiting complementary colours to create magic effects. A pure red object under light which has been filtered to primary red will be interpreted by the human eye as reddish white; under cyan (blue-green) light it will appear black. So Samoiloff dressed an actor with red make-up in a coat of black and blue-green stripes. Under red light this actor appeared as a white man in a black coat, while blue-green light changed him to a black man in a striped coat. Similar use of coloured lights and paint was used to change the appearance of scenery, particularly in relation to the seasons, and the technique became known as ‘the Samoiloff Effect’. Historically, Samoiloff’s use of filters is also interesting because his need for pure concentrated colour, coupled with his demonstration of the superiority of filtered light, triggered off the changeover from lacquered lamps to compartment battens on British stages. This is a commonly used method for ensuring the lighting state looks interesting and natural. Having a single colour washing the whole stage can look flat, and can use a lot of lanterns. By using a warm (rose / pink / straw / yellow) from one side, and a cold (blue / lavender) from the other side, mixing additively, the state looks good, and a wide variety of different moods can be created by varying the relative intensities of the warm and cold lanterns. 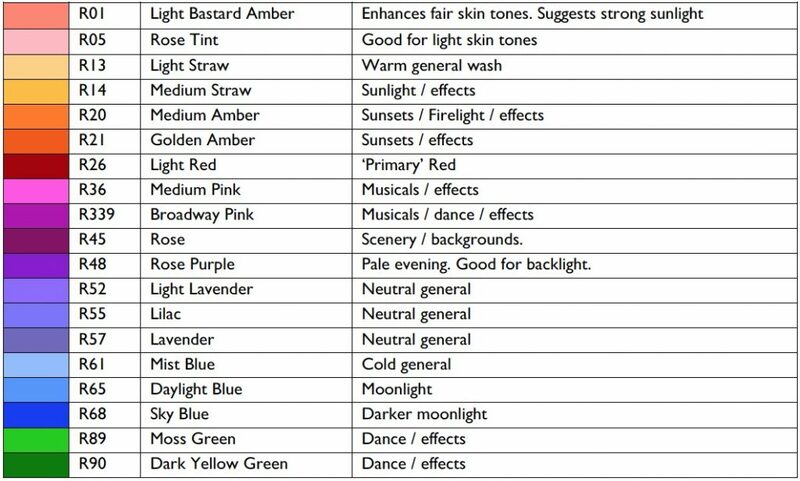 Colours such as lavender can act as a neutral balance, and can look either warm or cold, depending on the other lighting on stage. Using a single colour to wash a whole stage can be a striking effect, however, the stage picture can lack dimension. Using two similar colours can help to add interest, and contrasting colours can tell a completely different story. Why do we need colour at all? A shift in colour tone in line with the emotional changes of the characters can help the audience to go with the flow. A cool clarity or starkness can be achieved with colour correction filters. A comedy might have some warm (pink/yellow/gold) tints to establish a cheerful atmosphere. Some shows may use no colour at all, others may have a very saturated palette with intense colour (and of course everything in between). Colour choice can make or break the set designer’s scenic or costume choices. Use pale colours for acting-area lighting (front lighting). Use deep colours for side- or back-lighting, or for special effect. Yellows and oranges are “warm” colours for sunny days or happy times. Pale blues are “cold” colours for less happy times. Lavenders are “neutral” colours and can appear warm or cold depending on the other colours in use at the time. Lanterns with no colour gels (marked as “O/W” for “Open White” or “N/C” for “No Colour” on the lighting plan) can appear warm due to the high colour temperature of the light source. When lighting the same space from two angles, use slightly different (or even contrasting warm and cool) colours to add interest and make the lighting look more dimensional. Darker skin tones respond to colour differently. Lavenders & pinks work better on dark skin than straw / yellow. As with everything in lighting, there’s absolutely no reason why you should follow any of these rules. What do you need to think about when choosing between colours? There are many different sizes of lanterns used in the theatre industry. All of them have their own sized colour frame (or gel holder). This is a metal or fibre frame which holds the colour gel firmly in place at the front of the lantern. There are references online which tell you the size of the colour frame for a particular size and type of lantern. 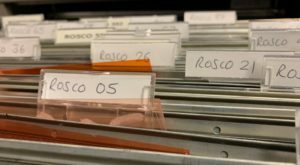 You can use a filing cabinet drawer to store cut gels, with suspension files for each colour. Gels should be labelled using either a white paint marker or a chinagraph pencil. Colour Temperature is a method for measuring the spectral content (or warmth) of ‘white’ light, and is measured in degrees Kelvin (°K). The Kelvin scale extends from 2600°K for warmish white light (with a red content) to 6000°K for white light with a high blue content (cold). Most halogen lamps used for theatre are rated at 3200°K. Colour temperature is more critical for the technical eye of a film or video camera than for the human eye, which will adjust to read any variation as pure white. The increasing use of LED lighting has added an additional parameter – the CRI (or Colour Rendering Index). This is a measure of how well colours are illuminated by a given light source. Halogen lamps have a very high CRI (closest to 100), and some LED lights (which produce an approximation of white light) have a relatively low CRI. Most theatrical applications use standard sheets of gel, made by companies such as Rosco, Lee, Gam etc. However, some applications, particularly permanent installations, require a more heavy duty approach. Gray Glass make a range of coloured glass called Devon Glass. This range was used on the London production of Beauty and the Beast at the Dominion Theatre. A number of companies make dichroic glass filters, which have a very long life. First online July 2016. Latest update: April 2019.